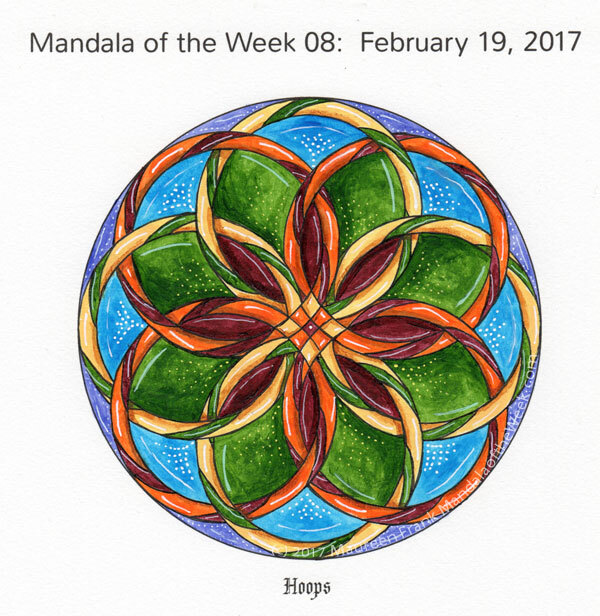 I present my coloring/painting of this week’s Mandala of the Week: Hoops (from Sunday’s MotD post). I was so looking forward to painting this week’s mandala and it didn’t disappoint. I knew I wanted to put the focus on the “negative” space (spaces inside and around the hoops). I started with the center ‘petals’ and saw them as a deep red. From there, it would just popped into my head as to which color to use next. I worked from the inside out with the background and then painted the hoops and the center. Topping it off with gel pen highlights.